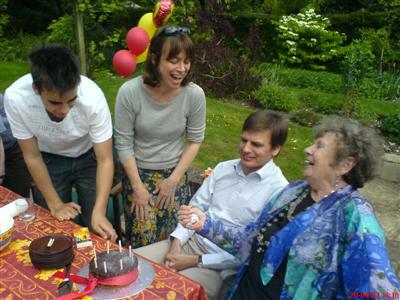 Friday was Mum's 80th birthday so we celebrated twice. I took the afternoon off work as did Ian (and Jane is a "home-maker" as the Americans say). I caught the train down to Farnham where the three of us, Mum and Dad had lunch at the Loch Fyne Restaurant. 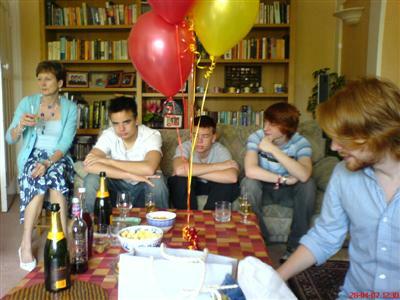 Then on Saturday we all reconvened at Jane&Pete's place in Reigate where we were joined by most of the grandsons for a great present giving ceremony and birthday toast with a glass of champagne. We then had a buffet lunch in the garden and fortunately is was a gloriously sunny day. 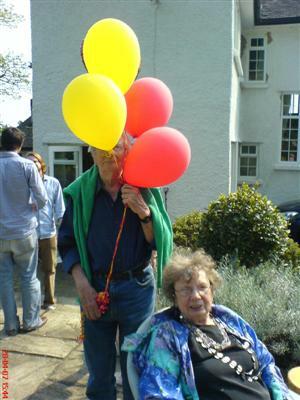 This was followed by a cake which Sarah had made complete with eight inextinguishable candles - one for each decade. Lorenzo (Ian's eldest) joined us halfway through the meal. Only Mike (Jane and Pete's eldest) wasn't able to make it as the band he is in (Thumpermonkey) had a gig in PLymouth the night before. Well it had to happen I guess. Ever since working at the current client site their company firewall has banned access to inappropriate sites. Fair enough. Their definition of inappropriate has always included web mail, so no catching up on your correspondance even at lunchtime. That means no blog-surfing at lunchtime to catch up on the blogroll; no more quick posts from work; no more commenting on others blogs. Oh well. Apologies to my regular reads. I have been off air as we went to the Hovel-in-the-Hills™ for Easter. This was our first holiday there planned as a holiday not chivying the architect to fix the snagging list. We went out with friends Tim&Sarah, their two children Alex and Zoe plus an old friend Ros. Alberobello: Of course the world heritage site of Alberobello is a must. 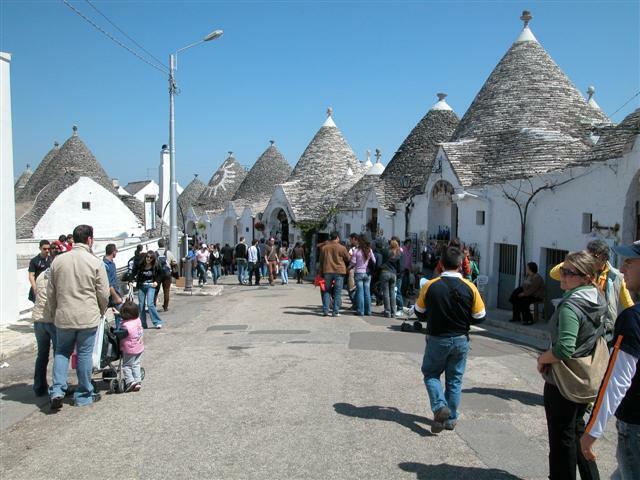 A town of trulli only 20 minutes drive away. 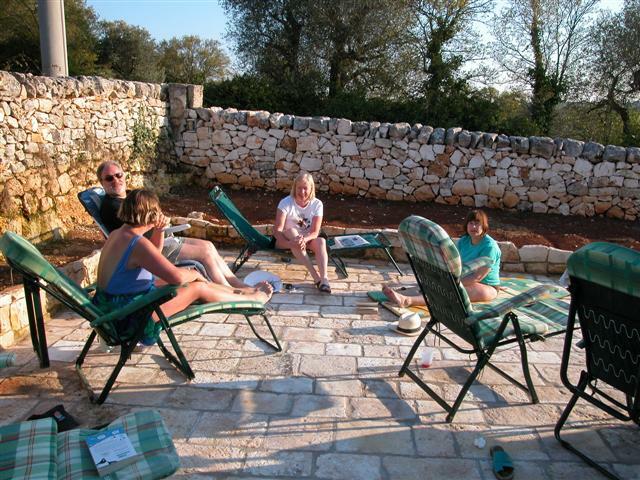 Sarah, Tim, Mary and Ros relax: We managed to fit in a good amount of sunbathing. 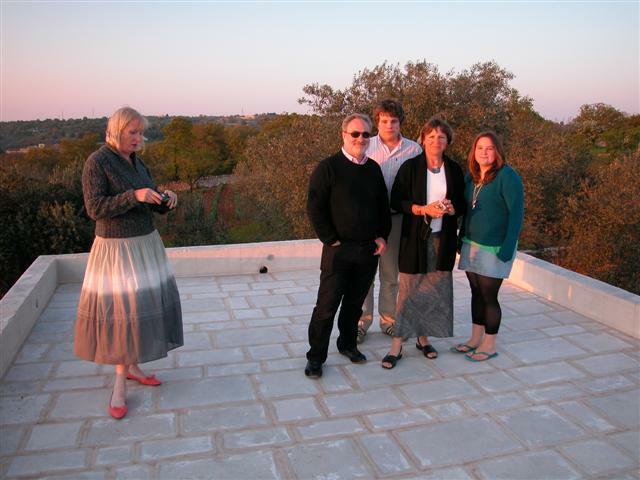 Moore Family on the Lamia Roof: Watching the sunset from the roof top with a glass of prosecco in hand is a daily ritual after a hard day's sunbathing.